"Even though I'm not from this world... To still be chosen..."
It is a wonder how the United States is paying attention to a mere presidential election when the mysterious and glorious light show has been traveling the world as of late. As the underdog in the last match, Yuki has toppled over possibly the only contestant left who can stop Fate from a perfect season that could culminate in her crowning. Last Friday, Yuki blew Kagami away in New York with an incredible 241 extra votes after tasting defeat earlier in the tournament in Cairo by the very same opponent. The time has now to prove that she can win against Fate twice in three days. Yuki is one of the only three who managed to hand Fate a loss back in the regular season in Topaz 6, the last loss before Fate began an incredible 40-win streak before Diamond 2. Fate is also looking forward to this match in hope of not only proceeding with a final 12-0 win streak since her 19-point loss to Shana in Diamond 2, but also to gain revenge against Yuki for that loss early on in the round-robin stages. However, things are different now and the stakes are far higher than ever before. 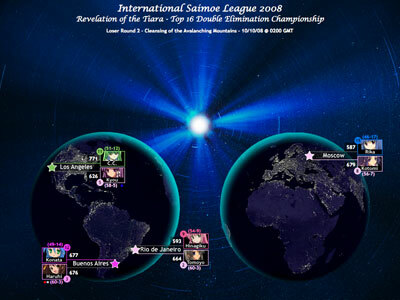 Fate overcoming Kagami with the most votes ISML has ever had in one match (999-658) can be rather intimidating, but with the Lucky Star trio now out of the picture, the playing field has changed entirely, and what better place to settle the score in the heart of all anime: Japan's very own Tokyo! 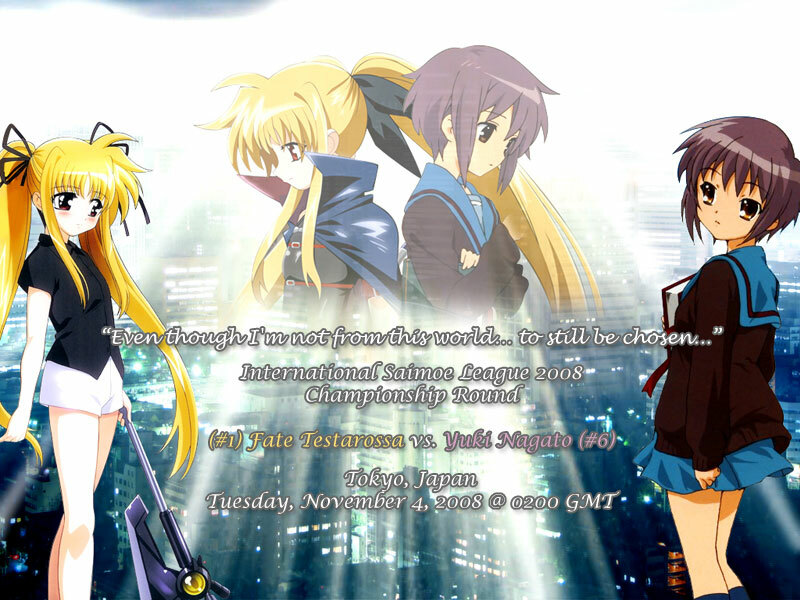 Will Fate come home undefeated, or will Yuki pull a double upset and prove herself to always be triumphant over Fate? "This light... I don't want to lose it..."
It is Halloween in New York City, and many have started trick-or-treating only to find two shooting stars in the sky. Yes, this revelation is close to nearing its end, and with only three shooting stars left to encircle the world, the crowning of the holiest of all tiaras will commence in only a short time to come. This time, Yuki and Kagami meet again in the losers' bracket, and it was actually Kagami that sent Yuki here in the first place. Now with the final competitor, Fate, already waiting in Tokyo, this final battle will determine the final match, and the loser will be left to continually ask herself, "What if?" 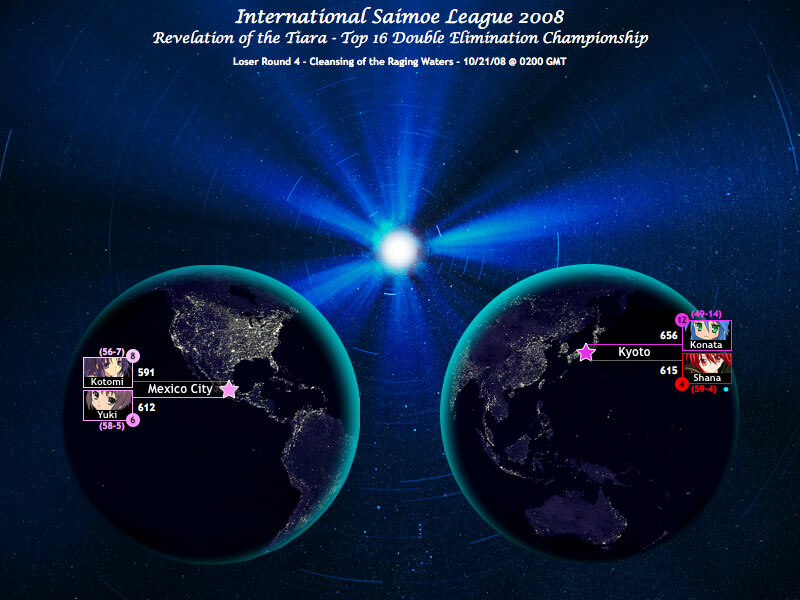 There is no telling how this battle will turn out, but there may be one X-factor that can prevent Kagami from winning today: Saimoe Japan is also coming to a close as well, and with Kagami making the final round absent, there has already been controversy brewing within the realms of Tokyo. With Kagami guaranteed a third place finish here and second in Saimoe Japan, this has been a good year for her. However, the matches against Yuki and possibly Fate as well as the winner of the Tsukasa/Hinagiku rematch in Japan will play much of an effect within each other. With hatred and love colliding, Yuki may pull a revenge win from out of nowhere and find herself eligible to perhaps even see the tiara. This can be the match that can determine everyone's fate. Will Kagami move on to try to defeat Fate once more or will Yuki pull an astonishing upset? "I will no longer be inconsiderate to others." 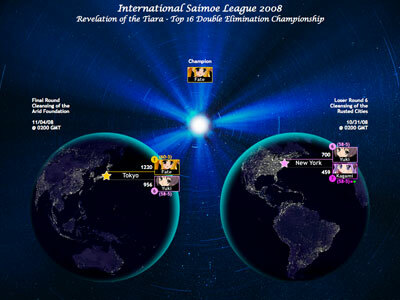 After a small mistake in the beginning of the tournament by losing to Kyou, who is now eliminated, Konata has made her way well through the loser's bracket, shockingly overcoming three of the elite seven one after another: Haruhi (#3), Tomoyo (#2), and Shana (#4) as if most were mere child's play. Now she has to take on fourth member of the elite seven, Yuki (#6), right after defeating Shana last Tuesday. The last time these two met was back in Emerald 8 where Yuki defeated Konata 303-258, nearly a 50 point margin. However, Konata has clearly changed since then and Yuki seems to have remained more or less the same. 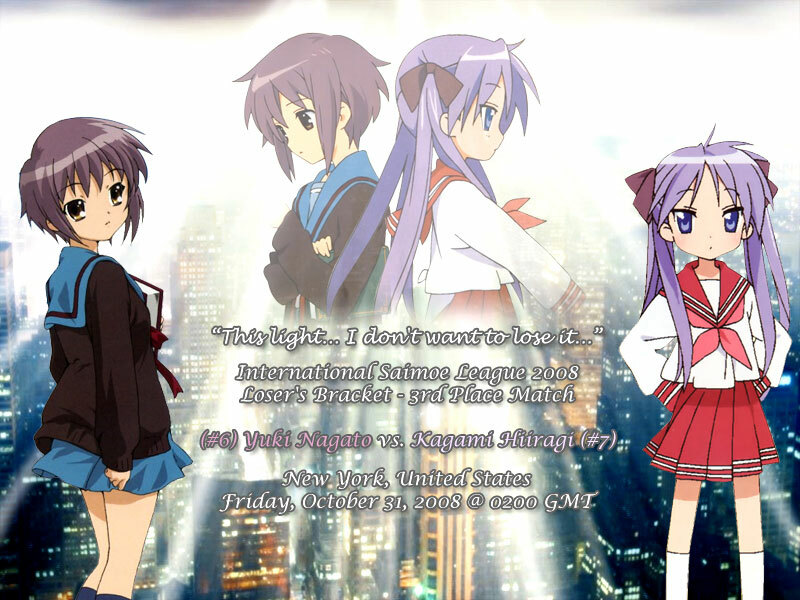 However, Yuki has a score to settle with Kagami (#7), whom the winner of this match will get to face on Friday. With Yuki now holding the SOS Brigade flag in place of Haruhi and in desparation to settle the 1-1 outcome between Kagami and her, will Yuki be able to keep the SOS spirit alive as the final member of the Haruhi cast remaining in this tournament or will Konata continue on her rampage to crush the dreams of the elite seven? "If destiny has called me here, then so be it." Unless Konata finishes her rout and successfully dethrones all of the "Elite Seven," this match can very well be the first out of a best of three series for the tiara itself. However, just because a candidate is able to experience the tiara's power doesn't mean she gets to see it. With a place in the final battle on the line, the two girls who finished Amethyst period in first and second place will now clash at the very home of Korea Best Moe. The last time both of these girls met, Fate defeated Kagami in Topaz 1, thus knocking her out of the Topaz race early. This time however, Fate will have to pit her own lightning against Kagami's newborn powers--that of the Amethyst and Emerald necklaces. Unlike the previous matches where a few candidates questioned her place in this revelation and others making rash mistakes that cost them the throne, Kagami and Fate both know what is at stake here, and the opportunity to not only see the heavenly tiara but also to bear it is close within reach. Fate does come in here as the #1 seed, and so far, she has proven that she has been the right candidate all along to hold that top seed. However, a set of voting statistics show that Kagami has been the most dominant candidate so far, with successful routs of Tomoyo and Yuki, not to mention Fate's best friend Nanoha, within the double-elimination stages. With Fate looking to avenge Nanoha and Kagami looking to put herself in a good position to win this championship, this is one battle that can turn in an instant. Is Kagami ready to hold destiny in her whole hands or does Fate have other plans? "To be honest, I wasn't expecting you." Kyoto, Japan, Kyoto Animation. Four of the six remaining have starred in works produced by Kyoto Animation. Yet the tiara seemingly does not take that into account, as it has chosen the skies of Kyoto as its next battlefield. In this matchup, J.C. Staff's lone remaining representation in Shana will have to play the away role against Kyoto's own Konata Izumi. The last time these two have met, Shana defeated Konata in Amethyst 5 by about 80. This time, however, the stakes are much higher, and apparently Konata has gotten a lot stronger since then. Konata has been on fire as of late, as she followed up with a near victory on her idol Haruhi Suzumiya by taking advantage of Tomoyo Sakagami in Manila, who broke down early in the match. She wants badly to be the supernatural presence Haruhi has yearned for, not to mention keeping her eye on Kagami who seems always to do better in these type of tournaments. However, keep in mind that Shana is no easy opponent. The Korea Super Best moe champion has already grabbed her fifth Top-4 finish, and an incredulous sixth is on the line here. Don't forget -- because she has the best overall statistical records, she may be the most hated, so Konata may be the favorite for this match. But with the top six as close in competition as they are, anything can happen, and both Shana and Konata will be on their toes. Will Shana conquer Konata's home-field advantage, or will home-field advantage actually work? "Whether you share your emotions with the world will be your choice alone." Two quiet personalities clash in a rather boisterous city. The District Federal of Mexico now plays host to one critical elimination match. As the only candidate remaining not to use an automatic bid from an outside contest, Kotomi Ichinose will now have to battle two-time Top-4 finisher Yuki Nagato. The last time these two have met in the battlefield, Yuki defeated Kotomi in Aquamarine 9, yet the margin was close enough for Yuki to be denied the Aquamarine Necklace. This time, the tiara is nearly in reach, and with the competition getting harder from here on in, it is time to play the right cards or fall from the sky into the freezing depths of the clouds. Yuki now holds the flag for the S.O.S. Brigade, and for a candidate whose series has not aired for close to three years now, she has still been holding strong throughout the years and may have a say in determining the final match. Kotomi is the last remaining member of the Clannad fleet and is looking for her first Top-4 finish after being knocked out early in both Korea and Japan. For a match that can go either way, one series will meet its end here, and with two soft-spoken girls who barely have any differences, a clear favorite isn't seen here. Can the alien from a world unknown tangle with the hashing sounds of the violin? "To be remembered for a lifetime... that's why I came here." Konata just got back from eliminating Haruhi within the last five minutes of regulation last week. Now she has to deal with the girl who defeated both herself and Haruhi, not to mention fifty-eight others, huge names among them. When these two met in the regular season, Tomoyo defeated Konata in Amethyst 7 by 22 votes. Since then, both of them started a rivalry, and who would be surprised, given that Konata tends to be the exact opposite of an ideal student, which is not exactly a school president's cup of tea. Already in her first year of competition, Tomoyo has had the best of Konata twice, first in the guaranteed match within the regular season, then again in Saimoe Japan, to which she defeated Konata by a full 360 degrees. However, do recall that in the last match, Konata finally got what she wanted--recognition from Haruhi, and anything short of a victory will be disappointing in itself. Don't expect Tomoyo to go easy on a slacker, though, because she has shown time and time again that she is worthy of holding the world's secrets. The winner will head for a home-field advantage match against Aquamarine winner Shana, a blazing competitor who, oh, by the way, has a bone to pick with Tomoyo. Will Tomoyo defeat Konata or will the lazy otaku pick up the pace and pull another upset? "Eternal happiness can only be obtained by eternal peace." The last time these two have met in the battlegrounds of the specially prepared arenas, Kotomi defeated C.C. in Diamond 9, the final match of the regular season. Now, these two meet in the skies of Jakarta, and rumor has it that since her defeat, C.C. has brought some backup. Not only did the holy empire of Britannia announced a momentary ceasefire to support C.C., but the citizens of Korea have also started to extend their lights, and in a match where light source is everything, C.C. comes into this match with huge momentum. Looking at her dominating performance against Kyou, of all people, C.C. may have Kotomi's number, and it especially looks like Kotomi will meet the hands of defeat. However, don't expect the horrible yet beautiful violin player to go down without a fight. This is the last remaining tournament in which Kotomi is still active, and it also happens to be her only top 16 finish this year, and while she has had a lot of fun and made new friends, she would like to go home with more than a top 8 finish. The winner will head to Mexico City in a showdown with Yuki, and you can bet C.C. is looking for payback after what went down in Johannesburg. Will C.C. become this competition's Cinderella or will Kotomi play her a lullaby to sleep? "I promised a certain someone that I would win for his/her sake. That's why..."
Someone should have mentioned that August 6th, 2008 was only a preview of what was to come. Both matches are from Diamond 2, and both matches are located in Africa for this winner's bracket show down. In the biggest match of the regular-season by total votes, Shana defeated Fate by only 19 votes in a total that reached to 1111. For those of you who love numerology, "11" means the potential to be a source of illumination and inspiration. With two elevens in their regular season match, we may see the first of probably a best out of three in the finals with the tiara at stake. Of course, the loser will have to maneuver her way through the loser's bracket first, and that is a tedious task. With the match in Lagos, Nigeria, one particular Nigerian pointed out something peculiar - the Aquamarine Necklace here is a dud. With Fate having mastered the power of lightning, using the Aquamarine Necklace will be the last of Shana in this high-powered match. Of course, Shana knows, and she has barely beaten Fate with fire before, but now that we are past the regular season and into the excruciating finals, both know the other's style very well, so we could be in for the match to watch throughout this tournament. It's fire vs. lightning, round two, but which element will prevail? "Are you ready to open your heart to the world?" Since we're on the subject of numerology, here is a little more of the numbers game for you. Convert the date of Diamond 2 into numeric form - 08/06, and add the two numbers. You would get 14, which is today's date. Speaking of Diamond 2, this was the last time Kagami and Yuki met, when Yuki barely edged Kagami 555-533. The margin of victory, 22, is a trickier life path to understand since some numerologists don't believe it to exist, but it has to do with the extremes. Either one will find success throughout her whole life, or one will sink into the depths of obscurity for all eternity. Then again, Kagami was never a big believer in numerology at all so let's just leave it at that. While Fate and Shana may hold the ranks of having the most recognized match, this is the most recognized match within the Kyoto Animation crowd, and unlike Shana, Kagami can actually use the powers of both Amethyst and Emerald in her favor. Yuki, however, can do much more than that, as she can bend reality in itself, and with that in mind, Kagami will have to tread lightly or face a knock down into the losing bracket. Haruhi and Konata faced off last Friday, so now it is time for the second main girls to take flight in Cairo, the delta of the longest river in the world. Will Kagami win this match or will Yuki barely escape the bad end of the river? "They will be proud of you regardless. I promise." 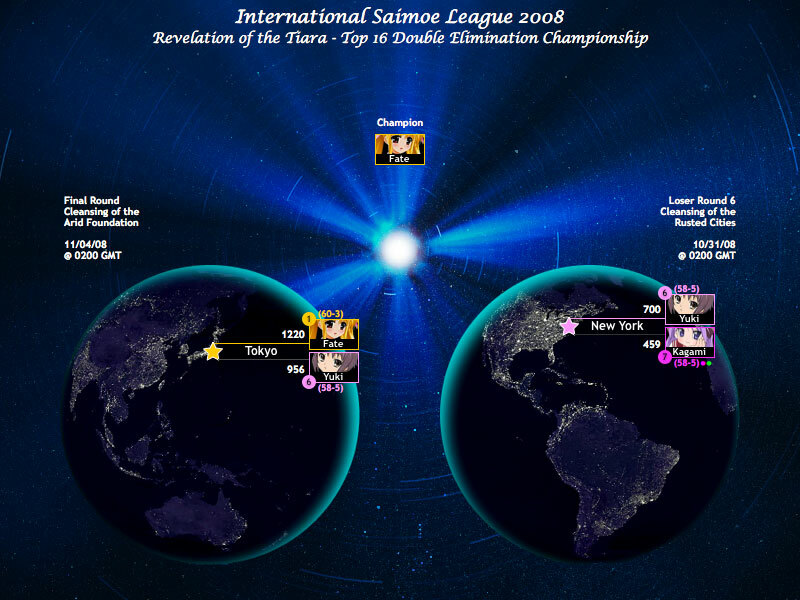 Had Tomoyo won her match against Kyou in Korea Best Moe 2008, this would have virtually been a 36-hour match on both fronts. Instead, Hinagiku and Kyou had to end their match twelve hours early, as the tiara has called them yet again. Rio de Janeiro is not far from Sao Paolo, which will host a crucial 4th place match in the coming weeks, but knowledge of the scenery will play an important role here. Last time these school presidents met, an undefeated Tomoyo defeated a surging Hinagiku by only 33 votes. This time, it is the brink of elimination, and this match can completely go either way. With the similiarities between each of their personalities, it will all come down to appeal, and Tomoyo has the slight advantage... as her most recent appearance came after the end of the Hayate no Gotoku! series, so you would think Tomoyo would have the advantage here. However, with Hinagiku still alive in Korea and Japan, the results may parlay out differently. There is no way to decide who the winner will be because of their similarities in personality, and they have become somewhat the best of friends throughout this tournament. This will come down to silver vs. pink for sure, but there may be a secret among one of them that the other doesn't know. Which school president will come out on top? "It's time that you know who I really am." Konata has been waiting for this her whole entire life. Back in Ruby 5, she had the battle of her life when she went to overtime with Haruhi, and although she lost, she at least loved to compete against her idol. However, seemingly, Haruhi is not convinced that the 2007 Saimoe in China champion should deserve to experience the light of the tiara, whether she herself falls or not. Now, the two meet again in Buenos Aires, the birthplace of the tango, and this is one tango you cannot miss. The Melancholy of Haruhi Suzumiya has not aired for quite a while, but Haruhi has left a lasting impression since then, and she has done well in the Saimoe tournaments she has entered since her early knock out from Saimoe Japan 2006. Yet, for having such a popular name and the recognition that goes along with it, she still has yet to win a championship. On the other hand, Konata is itching to actually defeat the one girl she has looked up to throughout her life, and she wants to make up for her loss in overtime the last time they met. The winner of this match will take on the winner of Rio de Janeiro, but the last thing on both of their minds is which school president they will take. Can the president of the Haruhi fan club take down the deity herself? "Will I be happy with my life if I were chosen?" A huge anime market in Los Angeles is already anticipating this match, but with two stellar matches in South America already giving people trouble deciding, this may be a match that will go as silently as the wind. The last time these two have met, Kyou literally dominated C.C. in Sapphire 7, and given the circumstances, Kyou may be looking for a repeat win here. However, since then, C.C. lost her memory, learned how to count higher than twenty, and in the process brought some voters to her side, and at this point, she is looking for nothing but a win after her recent knockouts in Japan and Korea. Unfortunately for C.C., the Clannad After Story series has started and is picking up speed, and with the only three Clannad candidates in this competition all facing elimination, Kyou is looking to keep that banner in play. After all, she did place first in the past preliminary, took the field by storm, and followed that up with a top-four finish with Korea, so defeating a silent C.C. who has stayed in 11th for most of the tournament could bolt her to at least a top 8 finish. The odds may be in Kyou's favor, but we have learned and relearned time and time again that anything and everything could happen. Will Kyou move on to a visit in Jakarta or will C.C. move one step closer to the desired tiara? "You and I will help them find happiness together." Moscow plays host to the only match on the Eastern Hemisphere today, and suffice to say, this was the unexpected match. Kotomi flew into Moscow expecting to see Nanoha, and was shocked to see the other Saimoe Japan champion in contention, which may parlay to Rika's advantage. The last time Kotomi and Rika met, it was the early Aquamarine match in which Kotomi defeated Rika by 101. A lot has changed since then in the last six months, and with the competition helping their own stock with new anime appearances, Rika is starting to slip down a steady hill. While she added a top-8 Korea finish to her resume, a loss here is something Rika will need to avoid if she is to be the Cinderella of this tournament. However, Kotomi's recent appearances in Clannad After Story have helped the viewing audience to know a little bit more of her character, or rather experience the violinist they have come to know and love. Also, Kotomi lost to underclassmate Tomoyo in Saimoe Japan, so she faces a situation others are facing right now - staying alive in only one tournament. Both Rika and Kotomi are facing similar situations, but neither will be willing to back down. Will the sounds of the violin shatter the night, or will Rika maneuver her way to a second title? "I have to endure this pain... or else I..."
Japan will have to get used to two shooting stars colliding in the sky, because it plays host to three potential elimination matches. Nagoya hosts the first of those matches as Tsukasa and Hinagiku collide today. Tsukasa is the only candidate in the top 16 to have a losing record in any necklace period, a (3-6) run in Topaz culminating in a loss to Hinagiku. However, it was then that Tsukasa started to find her form and shooting for the moon, having since then a handful of (8-1) periods and even a perfect run in Emerald, and given that she did well against Fate in Berlin, she may pull a fitting upset against Hinagiku today, thanks to the recent Lucky Star OVA. 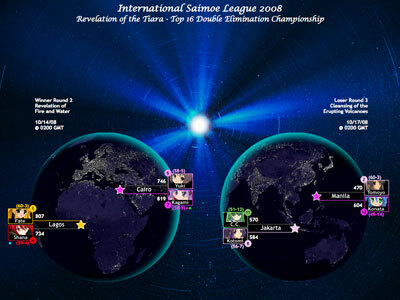 However, the 2007 Korea Best Moe Champion is still riding strong, as she remains in contention in all three of the major Saimoe contests, which includes a top 8 run in defense of her championship in Korea. The winner of this match will have to be aggressive, but at the same time conservative, because she will face #2 seed Tomoyo Sakagami in Rio de Janiero, and Tomoyo has been known to consistently win. The loser, on the other hand, will fall from the sky. Which of these two will be among the first to go home? "I won't let her down. But if I fall here..."
Suigintou may be in deep trouble. 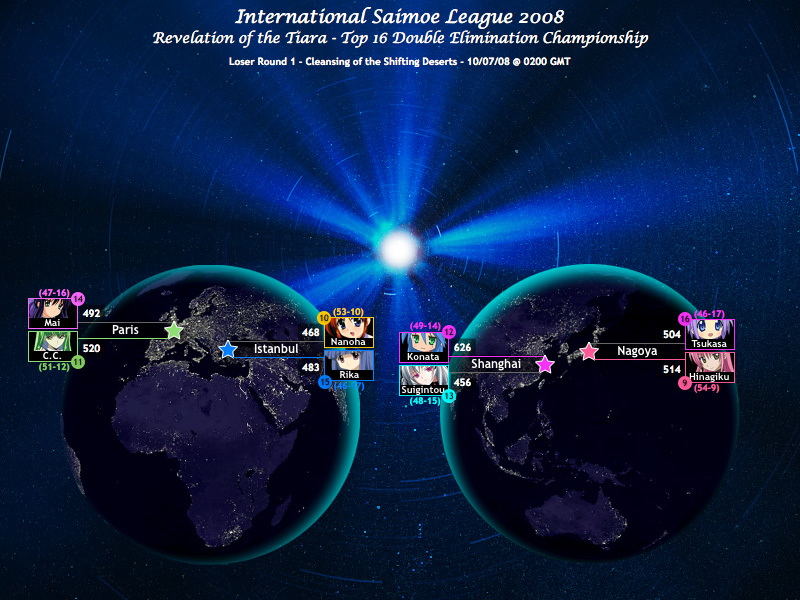 Sure, she did lock up yet another top 16 finish in her impressive resume, but after being shut down by Shana - again, - Suigintou will now have to face the 2007 Saimoe in China champion in the most populated city in China. In other words, Konata has a complete home crowd advantage as thousands of her fans wait to see her take the sky. The last time they met was in Amethyst 3, when Konata edged Suigintou by only about 60. This time, however, we may be prepared for one of the more stunning matches in this tournament, or we may see a doll go from complete to incomplete in about five minutes. Konata has that extra advantage of her new OVA, as well as the home crowd advantage of battling in the country that gave her a Saimoe championship. Not only that, but the winner of this match has a chance to eliminate Haruhi Suzumiya in Buenos Aires, and Konata wants to go against Haruhi again, badly. Suigintou will have to pull of a huge miracle if she wants to win the tiara, but will she get it is a question in itself. Can she do it, or will Konata take a practice run for what could be the match of her life? "Are you really trying to sustain the light of life?" This matchup is not as popular as the rest of the matchups that will be featured throughout this championship event, but the City of Lights may be able to revert that. The last time both of these candidates have met, Mai did defeat C.C. 131-106 in Aquamarine 6, but that match went rather silently in Arena 22. Now they take center stage in Paris, where a reversal may be likely. With the Clannad girls taking center stage as of late, slightly adding to their stock value with the After Story currently airing, Mai is slowly becoming an afterthought in the Key/KyoAni world, and her only second career top 16 finish in the world-open Saimoe tournaments may go very quitely as well. If this is truly the case, Mai may be in huge trouble, as C.C. just completed her second season of Code Geass and is in full redemption mode after being upset in the round of 32 in Korea. The huge favorite here is the #11 seed, but Mai's been known for her miracles. However, keep in mind that in this double-elimination event, every candidate has seen every other candidate at least once already during the round robin, if not before then, so this isn't exactly uncharted territory. The winner will move on to meet Kyou Fujibayashi in Los Angeles, but that potential matchup will be much more difficult than the one we will see today. Will Mai pull off a miracle to live another day or will C.C. pull this series to (1-1)? "You know as well as I do... that one of us will end this fateful journey..."
As of late, Istanbul has been well known for hosting conferences for most international associations. This time, it plays host to one of the most nerve-racking elimination matches to date. The final match of this round will feature two former Saimoe Japan champions, each not willing to let their careers slide just yet. The last time these two have met in the battlefield, Nanoha barely escaped from Rika's clutches by only 19 votes in Sapphire 7, and it looks to be just as close, if not closer, today. 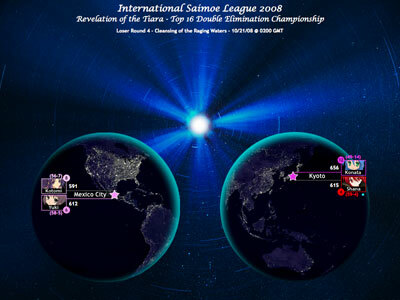 With Fate already locking up at least a top 6 with an easy win over Kotomi, Nanoha is all of a sudden behind her best friend, as a loss today may result in a finish far from satisfactory, and while none of her opponents from Saimoe Japan 2005 have participated in ISML, she has proved to have staying power ever since. If there is one candidate under fire, however, it is Rika. While her path to her own Saimoe Japan championship in 2007 was impressive to say the least, none of her past opponents are currently in the top 16, and she's already knocked out of this year's tournaments in both Korea and Japan, even though she left with a top 8 finish in Korea. To be able to hold the tiara for herself will be the greatest accomplishment for both of their lives, but in this destined battle of champions, only one will be able to meet Kotomi Ichinose in Moscow, Russia. Will Rika overturn fate again, or will Fate's best friend prove to be a better champion? "Is the world really calling for you, or is it calling for me?" Beijing spent millions over four years to make the 2008 Summer Olympics an event to remember. This time, Beijing has a free front seat in a revelation the world has never seen until just recently. Flocks of citizens gather around Tiananmen Square to witness a promising battle between top-seed Fate Testarossa and an ever-surging Kotomi Ichinose. The last time both met, Fate defeated Kotomi 276-201 in the Amethyst finale, but it was enough for Fate to fall short of the Amethyst Necklace. Both are on pretty much even ground this time, as both scraped away with victories of +85 and +56 respectively. However, Kotomi has a tough hill to climb in this match. Not only has she not found that level of dominance the top seven has had, but she has to deal with a top-seeded candidate who just got knocked out of Saimoe Japan. Speaking of which, neither wants to deal with a loss here - the loser will have to deal with one of the past Saimoe Japan champions on the brink of elimination, and that isn't enjoyable at all. Can the sounds of the violin repel the force of lightning? "One look in the eyes and I can tell... you're as wrecked as I am..."
In the last round, there was no match in South America. This round, Bogota plays host to possibly the matchup to watch this week, and this is one with a story of its own. While the last time they met was Aquamarine 3, that was the first time Kyou ever had a taste of "real competition," when she lost to the 2007 Korea Super Best Moe champion by 40. Back then, not one of the candidates understood the true power of the necklaces. My, how the times have changed. For the first time in postseason history, the solid foundations of earth and soil will meet the adaptation of water, in a continent filled with lush green grass and the largest rain forest to boot, as Sapphire will find Aquamarine in the sky in a battle no one will ever forget. Shana may have the advantage of fire to combine with water, but for the first time, she will have to look at Kyou not as a reckless newcomer, but a proven candidate to bear the world's secrets. Or is she actually a proven candidate? Had eleven extra particles of light been absent, Kyou would have been on the losing bracket from Konata's hands. Already, there is tension between both of them, but will the soil hold dry or will water burst through for the victory? "For the sake of the S.O.S Brigade, it's time for you to step aside." The skies of London, site of the new Olympics to come in 2012, plays host to the first inter-series matchup in this year's double-elimination, and voters will have to get ready to rid everything they've learned from The Melancholy of Haruhi Suzumiya, because Haruhi is feeling very melancholic right now. Actually, "steamed" may be the correct word to put it, because for the 5th time in Haruhi's career, she has to deal with a very annoying, yet very silent club member. Yuki's already gotten the best of Haruhi, up to the point that she can read her every move, as with the exception of the very close match in Korea Super Best Moe 2007, Yuki has practically brought Haruhi to the shores of "boring" reality, and that's not something the S.O.S. Brigade leader would enjoy lightly. This time, with her "first" experience of the supernatural she has ever experienced, she's not going to let Yuki stand in her way, and with the Diamond and Ruby Necklaces on her side, she may finally have what it takes to defeat Yuki and take one crucial step closer to the tiara. However, remember that Yuki did defeat Haruhi - or should I say, dominate her - in Topaz 8. Can Haruhi finally subdue her subordinate on top of the Big Ben? "Whichever the result, this will be a lasting memory for both of us." It wasn't that long ago that Tomoyo lost to Kagami in Diamond 7, back when there were Arenas then. Now, Chicago plays host to a battle between two huge favorites, both of which subdued past Saimoe Japan Champions to get to this point. 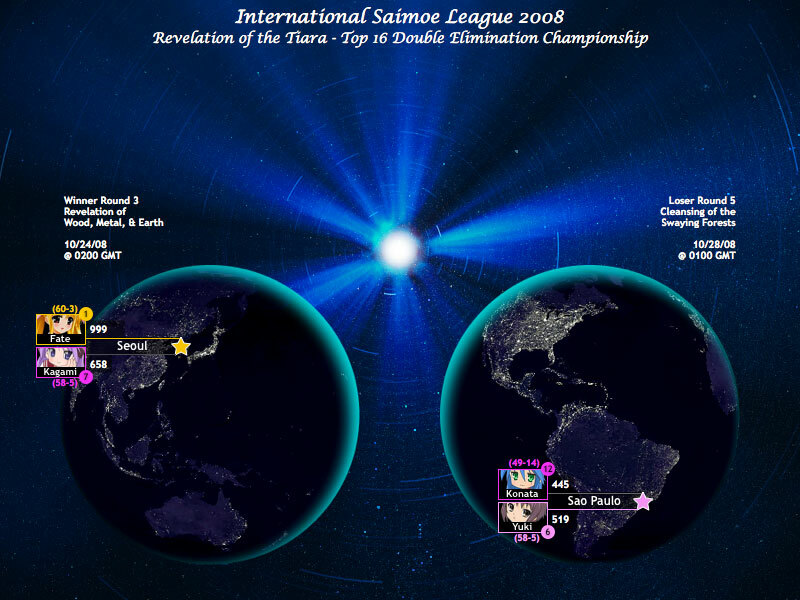 Tomoyo has already received recognition as one of the more dominating round-robin contestants in Saimoe history, and she has yet to fall in any of the three major Saimoe tournaments this year. However, Kagami, no stranger to defeating huge opponents, is looking for a repeat win. Both have been dominant since the beginning of the tourney, and the fact that both have had their own OVAs only set them apart from the rest of the field, but not against each other. 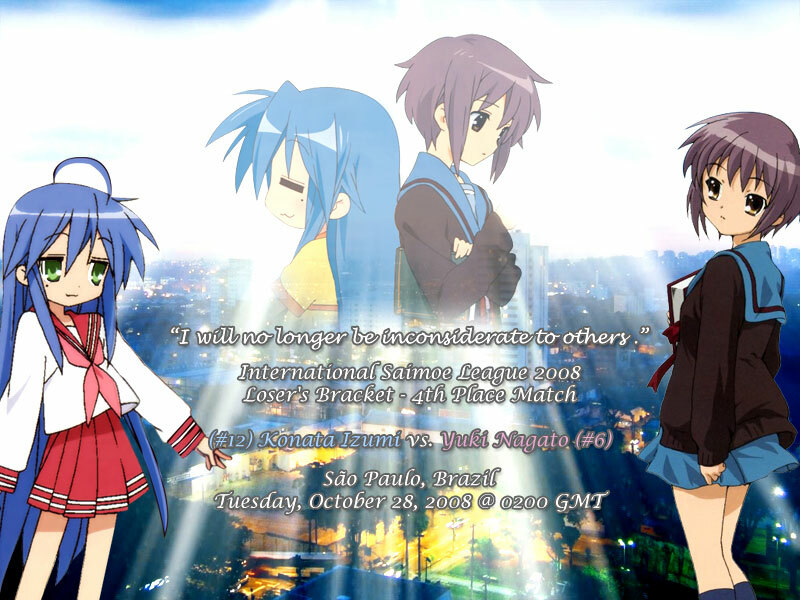 This could be the match to watch, assuming Shana dominates Kyou in Bogota. Speaking of which, loser heads to Rio de Janiero to take on the winner of Tsukasa vs. Hinagiku, and Kagami doesn't want to think about having to take out her little sister, and likewise for Tomoyo who just recently started hanging out with Hinagiku. It is the center of one of the most powerful countries on the planet. Will the power of Kagami's Amethyst and Emerald necklace take down the strongest round-robin competitor to date? "Do you think you're ready to bear the world on your shoulders?" The skies of Berlin, the site of the last World Cup and the infamous Italy vs. France match, has become a battleground like no other. In the regular season, Fate beat Tsukasa 274-190 in Amethyst 3. It's been four months since then, and we're not even sure if Tsukasa is even ready for the most intense match of her life since the legendary battle with Suiseiseki. Remember though, Tsukasa was barely one loss away from surrending the #16 seed to Nagi Sanzen'in, and right now, she's relieved just to make it to the top 16. However, don't let the seeds fool you - despite the fact that Fate is the #1 seed, Tsukasa looks to have the advantage, thanks to the Lucky Star OVA that just recently aired. Still, with Fate's most recent loss in Saimoe Japan, don't expect this match to be easy. One is more determined than ever before, while the other may still be wondering why she took this dangerous road of destiny in the first place. Will Tsukasa pull the biggest upset of this tourney, or will a yellow light color the Berlin sky? "So... we share the same tragedy after all..."
This is the only location in the continent of Australia that will feature a double-elimination match, but this one could be the most unpredictable. No thanks to both Shana and Haruhi, Hinagiku had a bumpy start in the tournament and only began solidifying her place in the top 16 around Amethyst. On the other hand, Kotomi has been rather strong throughout the tournament, consistently keeping her losses close while dominating the majority of her matches. Nevertheless, these two have been pretty much destined to face each other in the first round for the majority of the league. However, Hinagiku has never had much luck against many of the Clannad girls throughout the season and Kotomi isn't an exception. Kotomi defeated Hinagiku in Topaz 6 by 100 votes, and there is no doubt that she won't hold back. 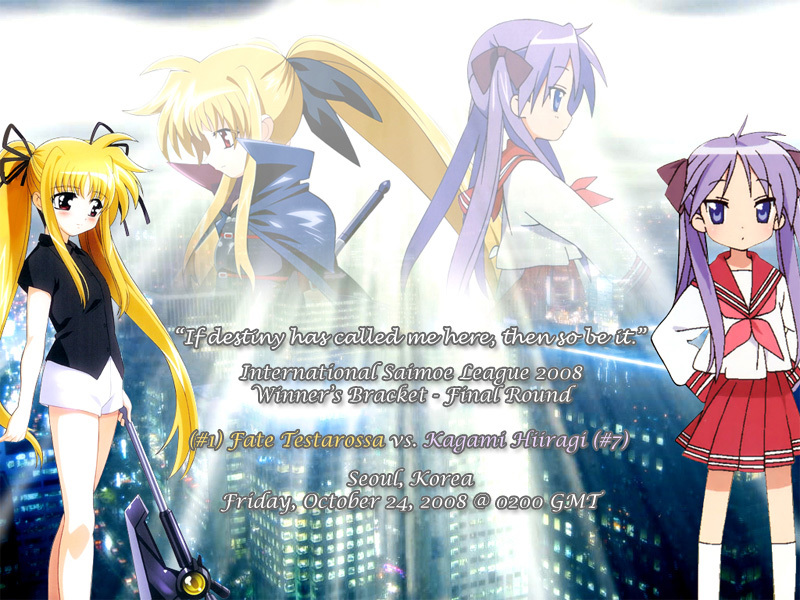 The 2007 Korean Best Moe champion will need to really push herself here to beat out the newcomer Kotomi. The winner will head to Beijing to take on probably a stronger contender, but unless Hinagiku pulls an upset, the winner of Berlin will take on Kotomi. Could Hinagiku extract revenge, or could she be distracted by her own emotions to do so? "Why would a girl like you be chosen to bear the Tiara?" Kyou defeated the entire Lucky Star cast in the round robin regular season, but lost to Haruhi. Now Kyou is having a rematch with the one who nearly beat Haruhi towards the end of the round robin. Konata, having taken her very own idol into overtime, now has some hope of taking on the former dark horse of the tournament. 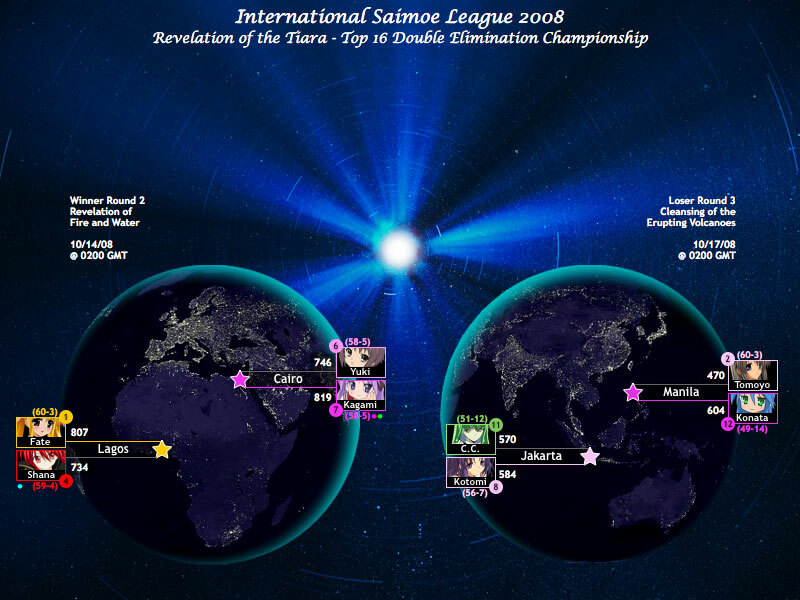 Kyou dominated ISML's open preliminaries, but surprisingly slipped around the Diamond period. Konata has always liked picking on weaknesses of her friends and opponents, but she isn't sure if Kyou even has one, thanks to the Sapphire necklace on Kyou's side. However, Kyou does have a weakness. Whether or not Konata extracts her weakness will be up to her own power, which by the way, has gotten an extra boost thanks to a last minute effort of airtime. The skies of Taiwan have never been brighter. Is this the day Kyou finally loses to a Lucky Star representative? "You're different from the last time we met..."
St. Petersburg, Tokyo, or the N-field, it doesn't matter, because the last girl Suigintou wants to see is Shana. Memories are painful in this storied matchup, at least on the Mercury side. After all, not only does Shana rank first in vote differential as opposed to Suigintou's last, but Shana has virtually flat out humilated Suigintou twice, first in last year's Korea's Super Best Moe by 600, but again in Diamond 1 by a much higher differential percentage wise. In fact, this rather one-sided rivalry has become so one-sided that Shana comes to this matchup wondering what the Cordillera Occidental looks like, not to mention which of Kyou or Konata will Shana meet when she gets there. The odds are against Suigintou in this match, as Shana has more than 10 wins, not to mention more top four finishes in Japan and Korea's tournaments as well as the airing advantage between their respective series. Oh, yeah, and Shana has both fire and water on her side, thanks to her Aquamarine Necklace. However, this one match is the most meaningful to Suigintou in her entire life as a Rozen Maiden. She personally feels that if she couldn't ever defeat the one girl who literally destroys dolls for a living, she may not even be able to save her own medium, whom has held a lasting impression in her Rosa Mystica. Could Suigintou finally overcome Shana or will St. Petersburg see much more red than violet? "Little do you know the supernatural that exists around you..."
Mai started out rather strong at the beginning of the round robin, even making it into the top 10 for quite some time, but she suddenly fell out and struggled to get back into the top. Haruhi, on the other hand has constantly held her own in the top 7, but in the end solidified her spot as the #3 seed behind two of the only three candidates (Yuki is the other) she has lost to. If there is ever a more one-sided match than St. Petersburg's one sided rivalry, it's the one that's taking place in the city that has endured a sorrowful past, one that Mai would like to reverse. Mai may have just been tired from too many of the seemingly endless matches in the round robin competition, but a month has passed, and she is fully recovered. Still, it's ironic how only her second top-16 matchup, in any elimination tournament, is against the same opponent that took her out of contention in 2007's Korea Super Best Moe, and we're not even going to mention their encounter in Emerald 5. Haruhi has both the Diamond and Ruby necklaces in her possession, not to mention the divine power of the gods behind her hoping to blow Mai away yet again. Then again, Mai knows much more of Haruhi's hidden nature than Haruhi does, which could parlay to an advantage. But will Mai pull off a huge upset or is Haruhi taking a one-way trip to London? "You're not even from this world. Why are you even here?" Yuki has been the silent killer in this tournament by defeating or coming fairly close in defeating many of the top contenders. Although she has never claimed a necklace, she has defeated three top seven contenders (Kagami, Fate, Haruhi) and nearly defeated yet another one against Tomoyo. Yuki can do almost anything when she puts her mind to it, and with a sudden change in motivation and determination, she could find herself above Tokyo in six weeks. However, don't count C.C. out just yet, now that she has finally regained her memories. After being the virtual favorite to win this years Korea's Best Moe tournament, an upset by a potential newcomer took out a possible chapmionship. However, the long-term effect will be shown right here, when she faces Yuki with complete thoughts on redemption. In a city with a huge history of apartheid, Yuki now faces the immortal witch yet again having only recently faced her in Diamond 1, but C.C. can now properly think again. Amnesia out of the way, this is one particular matchup that may shock the world. Could Yuki find herself in an elimination at Los Angeles or will she beat C.C. yet again? "What about you? What will you use its powers for?" This could have been a Fate/Nanoha vs. Kagami/Tsukasa tag-team match up had the tiara not split them between Toronto and Berlin. However, the tiara did split the two for a reason, and while Tsukasa may be questioning why, Kagami knows why, otherwise she wouldn't have been chosen by both the Amethyst and Emerald necklaces in the first place. The last time these two faced was at the beginning of the tournament back in Aquamarine 3 where Kagami defeated Nanoha by twelve votes. However, Nanoha has been rather completely inconsistent, as she has pulled upsets against several contenders towards the end of the tournament and yet lost to some fairly incompetent contestants outside of the top 16. Considering Nanoha's recent inconsistency, this match is much more predictable than ever, especially since it has been six months since they battled each other... in ISML's specially prepared arenas. Now, they're in the skies of Toronto as particles of light, and Kagami has never been more prepared for this in her entire life. Can she pull a repeat performance or will Nanoha avoid Istanbul's elimination match? "Fate has kept me alive... for this very moment." Bangkok has such a similar feeling to Hinamizawa, but whether or not this works to Rika's advantage remains to be seen. After all, the 2007 Saimoe Japan Chapmion will be taking on the most dominant round-robin competitor to date. Last time they met, Tomoyo defeated Rika in the Aquamarine period, which seems so long ago that quite a lot has changed since then. Rika, as mentioned, already has a championship in her possession, but there is no greater prize then one that can save her own village from an escapable fate. But at this rate, Rika is merely hoping that Tomoyo is just as reckless as Nagi, back when Rika won her championship when virtually none expected her to. Technically Rika could keep restarting the match until it gives her outcome she wants, but Hanyuu's stuck in this year's Saimoe Japan, a tourney Rika was just recently knocked out of thanks to a one-vote upset. Can Rika pull yet another come-from behind championship run, or will Tomoyo find herself in Chicago long before then?